The turning of the calendar to 2015 also means the arrival of a “PBP year.” Paris-Brest-Paris, the most heralded, historic, and international of all grand randonnees now peeps its head around the corner and beckons to us randonneurs, a mere eight months away. I thought that deciding on a return trip to PBP would take little internal debate. I would set my sights on it, no matter what. Yet, as of this writing, I feel mixed. Like the self-help books taught me, I drafted a list of pros and cons to aid my decision-making. Been There, Done That: I rode PBP with Felkerino in 2011, and had a grand time. We even had a tailwind both ways. Both ways! Because my PBP experience was so satisfying, I wonder if I should move onto a new challenge. This might sound crazy, but there are two times that I recall feeling absolutely beautiful– one of them was my wedding day and the other was PBP 2011. PBP is awesome. How can the second time possibly compete with the first? Cost: PBP is expensive, much more so than a domestic flight and bike tour would be. I only have so much time for these kinds of activities. Since I did go to PBP in 2011, shouldn’t I move onto another challenge? Fatigue: Even though PBP is not the most difficult 1200K course, it’s still 1200K that must be completed within 90 hours. After the longer brevets, especially the 600Ks and up, my recocery time is a couple of weeks. It takes at least a month for my legs to feel lively again post-1000K or 1200K. If I go bike touring instead of PBP’ing, I see lots of new territory at a more leisurely pace that allows for full nights of sleep and a bit of off-bike exploring. Why do I want to completely exhaust myself for a four-day ride? Chipseal: A couple of years after the painful memories of the ride were stashed away, my friend Andrea reminded me of the brutal chipseal we rode over, particularly on the last day. We were tired and our bodies were ready to ride on smooth velvety roads. I remember that chipseal, and it now belongs in my cons column. Bathrooms: The number of people churning through the controls takes a toll on the bathrooms. As the ride went on, they deteriorated into various states of gross. I also found many of the women’s restrooms being used or just overtaken by men. That sort of makes sense, considering that the majority of riders on PBP are men, but it sometimes left inadequate bathroom accommodations for women, which I did not like. Language: I don’t speak French. While I did not find that I needed it during PBP because it was as though I was going through France in a bubble, I would feel better if I had a rudimentary understanding of the language. “Have you ridden PBP before?” While in France, randonneurs constantly asked each other the number of times they had ridden PBP, at least it felt that way to me, as I meekly responded that it was my first time. Fanfare: PBP is the one randonneuring ride that actually feels like a big-time event. There is a pre-ride expo. There’s even jersey pickup if you bought a jersey. People cheer for you as you ride along, and as you finish. I like that the local randonneuring events have a low-key feel, but I also enjoy being an event participant. It strokes the ego to have fanfare around your chosen athletic endeavor. I run marathons in D.C. so I am exposed to that kind of energy and encouragement when I run, but there is nothing in the domestic randonneuring realm that offers the big event thrill. Fitness and Health: After riding a full series and a hilly 1000K with Felkerino, and completing the rides in a somewhat deteriorated mental state but overall strong physical shape, I am confident we have the base fitness and abilities to tackle a big ride this year. 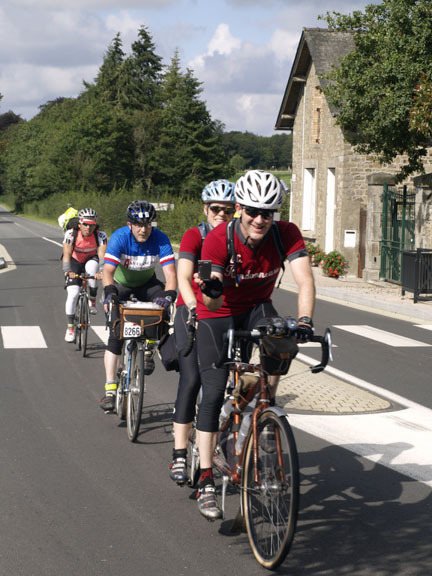 THE international randonneuring event: Not only is PBP the most historic randonneuring event, it is the event that randonneurs from all over the world attend. And if you ride PBP, you have the opportunity to talk with them! Maybe even ride a few kilometers together. 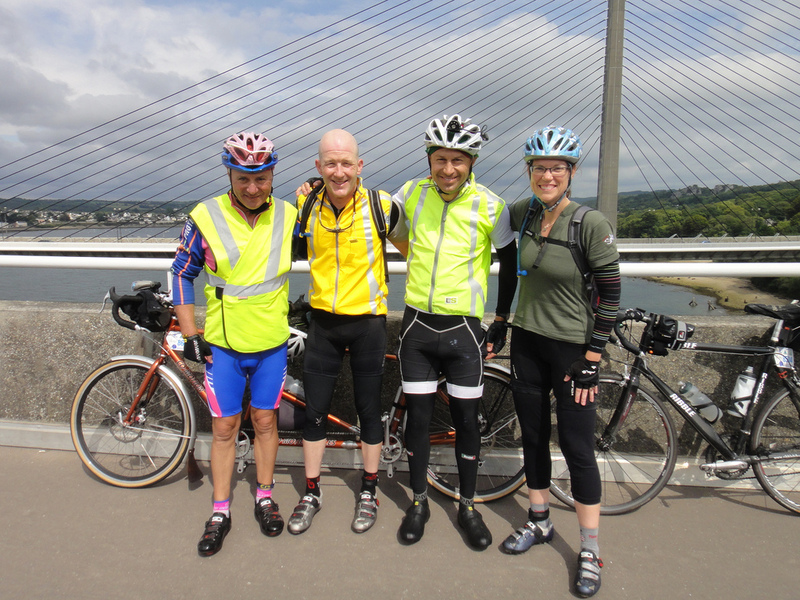 Those who regularly read this blog know that I like my riding to have a social element. This is one of the many reasons I love riding tandem with Felkerino. Constant social element! Through PBP, I met many new riders as well as randonneurs I only knew via the internet. It will be a thrill to see people I only rarely do, and to meet even more riders. 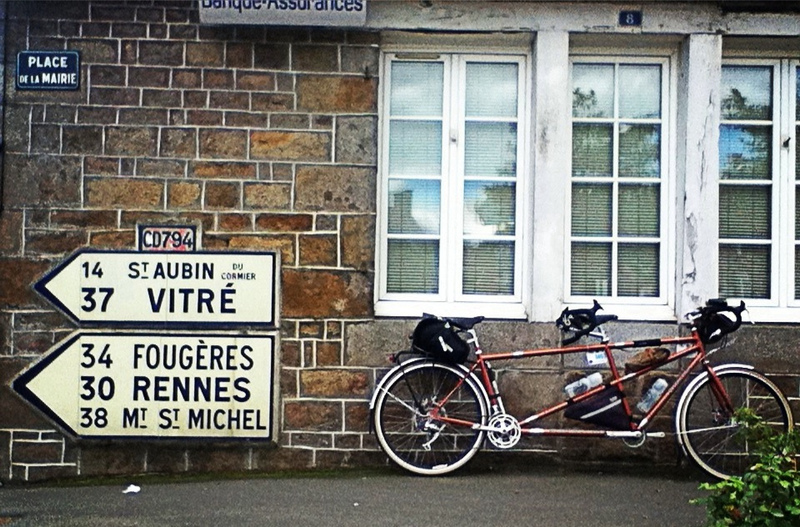 Tandem-friendly terrain: Compared to the domestic brevets and grand randonées, I found PBP to be a forgiving course for a tandem. Rollers you can crest without grinding to a slow pain ful stop? Check. Flat to smoothly undulating sections of recovery? Check. It’s “only” every four years: If I don’t go now, it won’t be until 2019 that the choice to ride will even be on my radar screen. Who knows what will be happening in four years? Since I have a pretty decent level of fitness and things look calm at the moment on other fronts, why not shoot for PBP? Perhaps I’ve listed my way to a decision. What do you think? if you don’t go will you regret it? what are the alternatives? if money and time were no object, what would you choose? me, if money and time are removed form the equation and i STILL hesitate, i don’t. I’ve not gone yet, and planning on it this year at last. I don’t anticipate going again. There are many demands on my time, and there are other rides and things I want to do. RAGBRAI has always held some appeal for me. Ride across the US also. So if you have other things you want to do, I say, go do ’em. Of course you must do it. Each PBP I’ve done has been completely different to the other PBPs. Do the 90 hour start – much, MUCH more social (and manic) than the 84 hour start. Too expensive? Do what I do; ride to and from the start. Ok, I admit that might take you and Felks a bit longer than it takes us chaps in the UK. But I’ve flown and I’ve ridden and I’ve driven. And ridden’s best. Well, your last point certainly has me thinking. Still not convinced about that 90-hour start. Seems a little TOO crazy to me, although I love the fanfare that comes along with it. Those magic moments that require physical prowess and the companionship of a special person, pass through narrow windows of opportunity and time. You certainly don’t have anything to prove and it will be different from your first ride but if all the stars are alined and it’s in your heart to ride one more PBP it would be tough to say no to PBP 2015. Yes… It’s a bit of a bummer to think that the opportunity isn’t always there, but that is also what makes it, as you say, magical. Good post. I’m struggling with similar things, though they don’t involve rando events. I’m planning on going back to the Lake Pepin three-speed tour in May. I went last year for the first time, and like you with PBP, it was one of the funnest bike/life moments I’ve had. So I’m really eager to go back this year. But I realize that it probably won’t be an every year thing after that, since there’s travel logistics and only so much vacation time I get in a year. Last year I used a week of vacation time, this year I’m planning on two since there’s a post-Pepin tour in WI I want to do with some folks. But to do all this I’ll be using two of my three weeks of vacation for 2015. And there’s plenty more touring I want to do! And to do Pepin “right” I’ll be missing the Oregon Outback again, sigh. I can of course do the course another time, but you don’t get that “excitement” you get from doing it with other folks. One of the big advantages of doing Pepin again is now I have expectations and know what I want to do differently. The novelty from doing it the first time has worn off, but it will still be fun! You’re so right about what you say about the Oregon Outback course. That is similar to what I thought about doing the 1000K pre-ride this last year. It didn’t have the event feel that helps propel you forward. While I liked experiencing what that was like, I still missed doing the ride w/ the field, small though it was. I’m going through the same quandary. For me It really boils down to cost and hassle of bike shipment. I’ve reached the point in which there is only a few more opportunities to go. Team Moose hopes to see you there. Transportation of the bike is another aspect. For me, that hasn’t yet become a con, but it’s definitely something to consider. Always a tough decision. I’m trying to do some different races/events because it’s so easy to fall into repeating. Not that there’s anything wrong with that. Agree, nothing wrong with repeating, but it’s also good to try new things to keep an element of novelty to it all, as well as meet new people and experience new places. Nice post, MG! My sentiments & dilemma almost exactly. One twist for me, I completed it in 2007, i.e. downpours instead of tailwinds, worst PBP weather in 50 years. So I have that for sure in the been-there-one-that CON column, but that also makes me add a new PRO, weather could only be better the next time! 🙂 So, a month later, have decided? Oh yes, I heard about that rainy year! Sounded very challenging. As for a decision, still not 100% committed one way or the other… you? After several months of dithering, I finally decided a couple of weeks ago to go to PBP again. I’m not sure _exactly_ why, but I think it has to do with the fact that in 2011, I was so totally focused on finishing. This time, I’d like to stop and smell the roses and take a photo now and then and have time to really relish France 🙂 My goal is to be in even better shape than last time so that I can still finish in time even if I dawdle slightly now and then. Two other reasons to go: I can still do this, now, who knows about four years from now; And, alternative 1200’s in the US don’t seem so interesting this year. Good luck with your decision. Just don’t expect tail winds both ways and smiles like the last time…..somehow life just doesn’t work that way. Not going because you do not wish to ruin the honeymoon memories would be a mistake. I’ve been dithering for the last twenty years, my stroke two years ago put a no to 2015 PBP. My last brevet was an adventurous 26.59 hr. 400Km the last two hours time trailing at ~ 30km/h avg to make the cut off. I only ride in dreamscape past and a possible future. Make each day an adventure, no matter the size.